MANILA, Philippines (CNS) — Initial assessments by Catholic emergency responders showed significant damage to coastal areas of an island province in the east-central Philippines, where a powerful typhoon first made landfall Dec. 5, but church officials said in some parts, chapels that were used as shelters held their own. Typhoon Hagupit started off as a Category 3 storm with winds that sporadically reached Category 4 and 5 speeds. The storm flooded roads, caused landslides, knocked out power and blew down houses. The Philippine Red Cross confirmed at least 22 dead, while the government had a confirmation of at least eight. Josh Kyller, Catholic Relief Services Philippines emergency response coordinator, headed a team in Eastern Samar province, which took Hagupit’s first lashings. Team members surveyed several small towns along the coast. A number of houses made of palm leaves and wood crumpled to the ground. Government officials of these small towns counted about 35,000 partially or totally damaged houses, which also included concrete structures whose roofs blew off or were riddled with holes. They did not yet have figures for Samar and Northern Samar provinces, also part of the same island. This part of the country is where an immensely destructive typhoon barreled through in November 2013. Typhoon Haiyan, with 15-foot storm surges and 195 mile-per-hour winds, ripped apart 1.1 million houses and left more than 7,000 dead or missing. Father Anton Pascual, Caritas Manila executive director, said the 40 chapels the agency had constructed for coastal towns in Samar and nearby Leyte provinces, after the Haiyan experience, all fared well during Hagupit. They were used as evacuation centers. “The secret is they were constructed for category five (typhoons), which is 252 kph (156 mph) and above,” Father Pasqual told CNS. Almost all the evacuation chapels in the Palo Archdiocese also held up well, said Msgr. Rex Ramirez, archdiocesan vicar general. After Haiyan, an open area near Palo’s Cathedral of the Transfiguration of Our Lord was turned into a mass gravesite as entire families were swallowed by the tsunami-like storm surges. Palo’s parishioners also fled their homes to take shelter in the brand new Pope Francis Center for the Poor. The pope will bless the center during his visit to the Philippines Jan. 15-19. With Typhoon Haiyan still very much on people’s minds, more than a million residents did not need much prompting to follow the government’s mass-evacuation orders. The result was the “largest peace-time” evacuation, according to the United Nations. 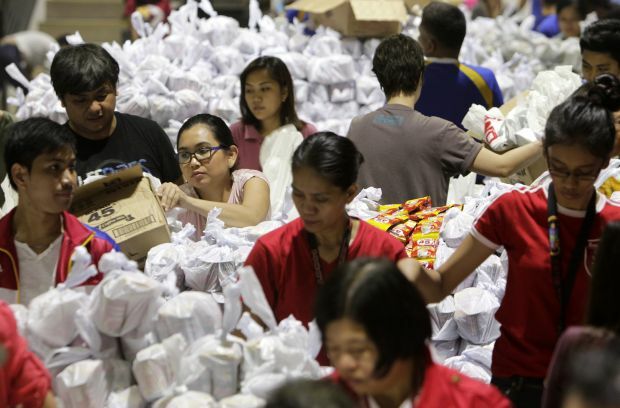 A Dec. 9 Civil Defense Office report said 1.6 million people remained at evacuation centers. Health officials were keeping a close eye for possible disease outbreaks. Kyller noted that from what officials could tell, “most of the areas that were worst hit (by Hagupit) were not as badly hit by (Haiyan)” a year ago. Following Hagupit’s first landfall, the military and aid agencies had to cut through lots of debris to get inside the coastal Samar towns, and relief operations started shortly after. Kyller said ships bearing provisions still had not entered those waters Dec. 9. Military C-130 craft were dropping off relief goods in Borongan City starting Dec. 8. But Kyller said in the afternoon of Dec. 9, relief workers faced an additional challenge: A bridge connecting Borongan to all major towns north of it collapsed. “We thought, ‘Here we are, a nice couple of sunny days, maybe it won’t be so hard.’ Well, no,” he said with a laugh. Hagupit plodded its way on a west-northwest track and lost steam, turning into a tropical depression by the time it reached the metro Manila area Dec. 8. It was expected to exit via the South China Sea and leave Philippine territory in the late evening of Dec. 10.